Merlin is a retelling of the Arthurian legends from the point of view of the sorcerer who was half human and half spirit of the night. The psychological conflict between these two apparently opposing sides of Merlin's character is the propelling emotion of the tale. The story encompasses Merlin's plan to manipulate the birth of a prince, who he will train to become a great king, in an effort to demonstrate to his lover Viviane (the Lady of the Lake) his belief that humans can be more than base, venal creatures. 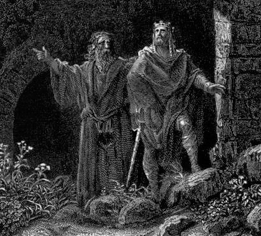 But as that prince -the great Arthur- grows to manhood and assumes the mantle of kingship, events increasingly force Merlin to accept something that many humans have long suspected: that earthly power corrupts, and that the world of spiritual integrity belongs, in the end, to the spirits that Merlin has left behind. Whether or not Merlin can find his way back to that spirit world forms the ultimate crisis of the piece. Merlin is the tale of a half-human sorcerer who decides (partly out of vanity, partly out of genuine faith) to prove that there is much good in mankind, only to find that his quest is ultimately a tragic and quixotic one: a story for modern audiences and a myth for the ages, as it has always been. excerpts from the story and the music . . .
All audio excerpts from Merlin performed by Orchestre Philharmonique de Radio-France. Bruno Ferrandis, conductor. Angelina Ruzzafante, soprano. © 2007 TLØN EDITIONS. All rights reserved.